The Pathetic Sympathy Seekers are a group of artists based in Berlin. Since 2003, they have worked in the mediums of performance, photography, video, installation and writing. The PSS address topics such as group identity, the reinvention of physical laws, the staging of life together, fictitious artworks, and the role of projection in art reception. All content by the Pathetic Sympathy Seekers except for photographs of Apparition and Teleportation by Tim Adler and photographs of living sculpture at CAPC by Frances Scholz. All rights reserved. Every request of usage, loan or reproduction is subject to prior authorization by the Pathetic Sympathy Seekers. 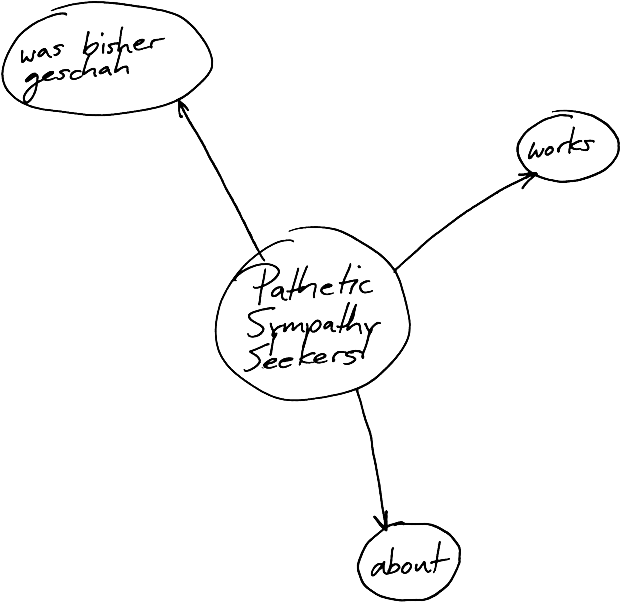 The Pathetic Sympathy Seekers are solely responsible for their own website’s content.